This training circular provides guidance for Army wide uniformity in the conduct of drill and ceremonies. 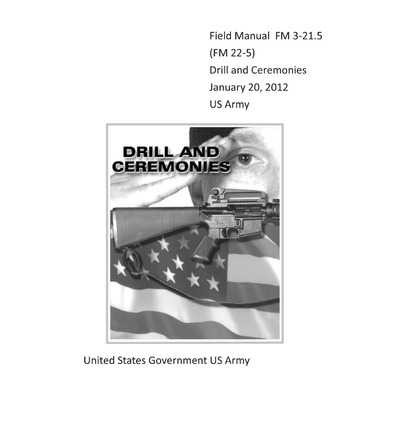 It includes methods of instructing drill, teaching techniques, individual and unit drill, manual of arms for infantry weapons, and various other aspects of basic drill instruction. This publication is designed for use by Soldiers of all military occupational skills, to include the new Soldier in the initial entry training environment. Since all situations or eventualities pertaining to drill and ceremonies cannot be foreseen, commanders may find it necessary to adjust the procedures to local conditions. However, with the view toward maintaining consistency throughout the Army, the procedures prescribed herein should be followed as closely as possible. Personnel preparing to give drill instruction must be thoroughly familiar with Chapters 3 through 7 before attempting to teach material in Chapters 8 and 9. For ease in distinguishing a preparatory command from a command of execution, the commands of execution appear in BOLD CAP letters and preparatory commands appear in Bold Italic letters. Reference to positions and movements appear in Italics. Army Regulation (AR) 670-1 should be used as a reference for the proper wearing of uniforms and insignia. This publication applies to the Active Army, the U.S. Army National Guard (ARNG)/Army National Guard of the United States (ARNGUS), and the United States Army Reserve (USAR) unless otherwise stated.